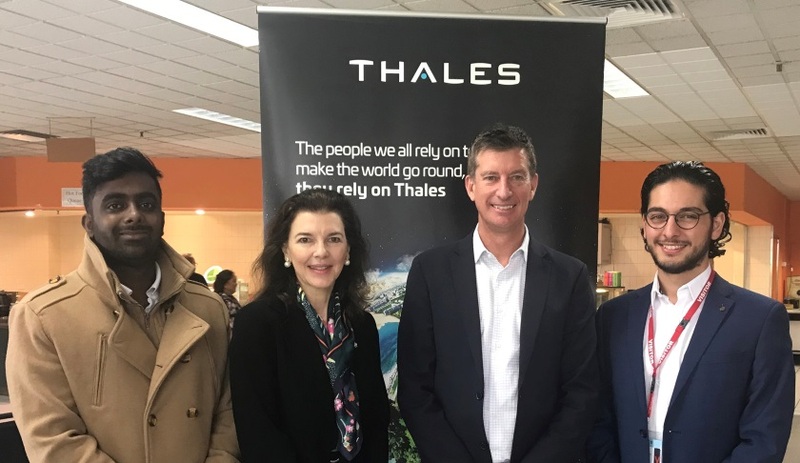 Two Western Sydney University undergraduate engineering students have been awarded a unique scholarship, supported by Thales Underwater Systems, as part of a new era of French-Australian relations to support the development of a competitive Australian underwater systems industry. The Lapérouse Education Fund, Université de Nice Sophia Antipolis (UNICE), WSU and Thales program sends third-year undergraduate STEM students from non-affluent backgrounds in the western Sydney region to the south of France where they will conduct underwater research assignments, supervised by the University of Nice, Cote d’Azur at Thales Underwater Systems France headquartered within the innovation hub of Sophia Antipolis, which is known as 'France's Silicon Valley'. Mechatronics students Michael Abdo and Muthu Kumaran were selected to participate in round two of this unique partnership opportunity, established in 2017 by Nicole Forrest Green of the Lapérouse Education Fund, on the premises of Thales Underwater Systems at Rydalmere. The program is 18 months in the making for Forrest Green, who obtained seed funding via a French parliamentary grant that helped send two initial students abroad in January of this year – Benjamin Futterleib and Daniel Farrugia. Six months later, the students returned to Sydney enriched and well qualified in their field. "I grew up in an area where opportunity and education were abundant and understood it was important to give back," Forrest Green explained. The partnership program targets non-affluent Australians doing their utmost to learn, develop and contribute; offering a life-changing experience to scholarship recipients. The combination of study and internship with Thales in a country like France was quite a coup to have been able to put in place. "Having lived abroad, I was inspired by the ideals of the French Enlightenment particularly in beyond the humanities, in a fields such as science. The epic voyage of Jean-Francois de Galaup, comte de Lapérouse, the first Frenchman to arrive in Australia at Botany Bay on 26th January 1788, leading a scientific expedition designed to rival Cook, had always both inspired and fascinated me as in modern terms this would be the equivalent of sending someone into space," Forrest Green said. Thales Underwater Systems is a leader in the design and manufacture of underwater sonar. Their current work for the Royal Australian Navy on the current Collins Class submarines includes a full transfer of state-of-the-art technology to the local Australian entity. Former Australian Naval Chief Vice Admiral (Ret'd) Tim Barrett, AO, CSC is a great supporter of projects like this one that generate pathways to careers in the defence industry for young Australians in the context of the strengthening of the Australia-France strategic partnership, Forrest Green explained.